One of the great characters in the history of Death Valley is Pete Aguereberry. His story is truly a dream come true. Born in the Basque region of southern France (as you can tell from his name), he was fascinated by the stories of the Californian gold rush. At 16, he emigrated to California. By 1907 he was installed in what's now the Death Valley National Park, with his very own gold mine. It hadn't been easy - there were several years of disputed claims and lawsuits. He stayed there until he died in 1945, working the mine by himself. It must have been a very lonely and hard existence. He lived in a small house a short way from the mine, a long way from the nearest town even by car. Even another other human presence was an hour or more away, and much more before cars were available. His name lives on today. Aguereberry Point is a 6500 foot peak overlooking Furnace Creek and the northern end of the Badwater valley, with magnificent views in all directions. He loved this view so much that he built the road to it, still in use today, so others could appreciate it too. Not far from the house is the rusted shell of an old car. There are many pictures on the web, generally entitled "Pete Aguereberry's Car". But to me it looked like a late 1940s model, too late for it to have belonged to him. I was intrigued to know whether it could in fact have been his daily drive. The wreck is in a sorry state. Everything that could possibly be taken, has been - the wheels, the seats, the instruments, nearly all the engine parts. Even the cylinder head has been taken. The body has been used for target practice and is full of holes. Vandals have evidently jumped on the roof, partly collapsing it. There is nothing that positively identifies the make or model. However there is one strong clue. The engine is a very unusual type, with eight cylinders arranged in one long straight line. Nearly all eight-cylinder engines use the V8 configuration. "Straight eights" have always been a rarity. They take up a lot of space and the length of the crankshaft means that the front and back of the engine don't necessarily agree with each other, or with the camshaft, about exactly where they are in the four-stroke cycle. They've only ever been used in very high-end luxury models. A quick Google search showed that in this period, there were only a handful of suitable models. Another helpful feature of the wreck is that it has only two doors - unusual in a luxury sedan. 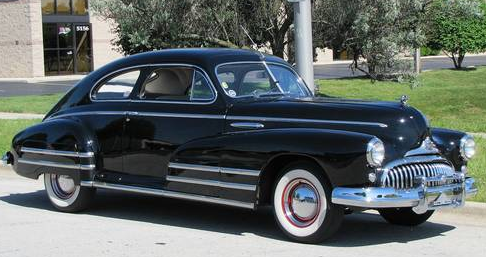 It was fairly easy to narrow it down to a Buick Sport from 1947 or 1948. All of the features compare, including things like the detailed line of the front wings flowing to the rear of the car and the remaining "fangs" of the grille. 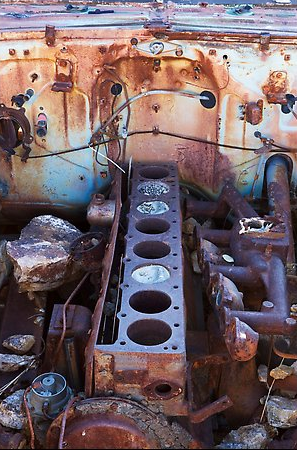 As further confirmation, the headless engine is clearly the overhead-valve type, like the Buick. Most engines in the late 40s were still of the "flathead" type, with the valves in the cylinder block. So it couldn't have been Pete's - he'd been dead and buried in Lone Pine for at least two years before this car was built. Whose was it then? The story relates that towards the end of his life, he was helped with the mine by a nephew. Could this have been the nephew's car? In any case the mine must have produced well to finance a car like this, the equivalent of a high-end Mercedes Benz today.